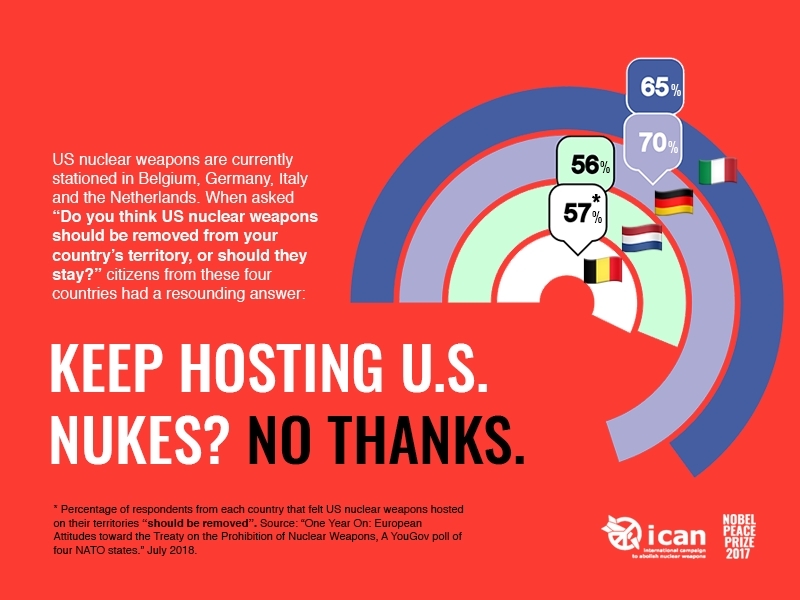 The International Campaign to Abolish Nuclear Weapons (ICAN) organised a poll in the Netherlands, Belgium, Germany and Italy about the position of their citizens on nuclear weapons. The results are very clear. Following the first anniversary of the approval of the UN Nuclear Weapon Ban Treaty on the 7th of July 2018 and the NATO-summit on the 11th and 12th of July, Nobel Prize Winner ICAN queried the citizens of the Netherlands, Germany, Italy and Belgium about their position on nuclear weapons. Last June, a survey was organised among 1048 Belgians. They were asked whether American nuclear weapons should be removed from Belgian territory, whether the Belgian government ought to sign the Nuclear Weapon Ban Treaty and whether financial institutions should be allowed to invest actively in the nuclear weapons industry. Finally, the respondents were also asked about their political affinity. The outcome: 57% of the Belgians want the American nuclear weapons out of Kleine Brogel, 66% want the Belgian government to sign the recent UN Nuclear Weapon Ban. 68% do not approve of Belgian banks investing in the nuclear weapons industry. The results match the outcome of the latest Belgian opinion poll conducted in 2014. At the time, 61% of the Belgians agreed with the statement: ‘All nuclear weapons stored on Belgian territory need to be removed.’ In the Netherlands, the result of the ICAN survey was almost the same. In Germany and Italy, the public opinion is even more hostile towards nuclear weapons: 70% of the Germans want to get rid of the American nuclear weapons in Buechel. In Italy, 78% of the population agree that financial institutions should not invest in nuclear weapons. In June, the French peace movement decided upon a similar initiative and organised a poll among the French public on nuclear weapons and military spending. 67% of the French citizens think that the country should sign and ratify the Nuclear Weapon Ban. The results in the 5 different Western European countries were consistent: a large majority prefer to get rid of the nuclear weapons on national territory, whether they are American nuclear bombs or an own ‘hit force’. What the 5 countries also have in common, is that the government policies are the direct opposite of the public's wishes. All of these countries are purchasing new jet fighters and don't explicitly exclude nuclear tasks. With the exception of the Netherlands, none of these countries even participated in the UN negotiations for a ban on nuclear weapons. But in the end, even the Netherlands now refuses to sign the Nuclear Weapon Ban Treaty, just as Belgium, France, Germany and Italy. In fact, within NATO these countries have a common policy which strives to undermine the credibility of the Nuclear Weapon Ban. They are claiming the new treaty is not representative because the nuclear weapon states do not take part in it. In addition, they claim that the ban undermines the existing non-proliferation treaty (NPT). The spokespersons of the Belgian Ministry of Foreign Affairs are also actively spreading this nonsense, most recently in June during a hearing at the Federal Parliament. You read that correctly: these countries are boycotting the UN ban and using their own absence as an argument to undermine its credibility! The argument that the Nuclear Weapon Ban would cripple the NPT is pure nonsense. Article 6 of the NPT clearly states that the signatories have to negotiate nuclear disarmament in good faith. It is true that the NPT is under severe pressure on its 50th birthday (it was adopted on July 1, 1968). This is merely due to the nuclear weapon states and their pallbearers (such as Belgium). Indeed, today these countries still don't comply with their obligation of disarmament under the Treaty. At the moment, they are even modernizing their nuclear arsenals, so the next 30 years we will have to continue to live under nuclear threat. The gap between citizens and politicians on nuclear weapons is bad news for democracy. Across political party lines, the majority of the Belgian voters believe that our country should sign the Nuclear Weapon Ban and that financial institutions should not invest in nuclear weapons. But apparently political parties can allow themselves to completely ignore their own supporters. By contrast, financial institutions do seem sensitive for the opinions of their costumers. In June, after years of campaigning by the peace movement, KBC, the largest Belgian bank, announced its immediate withdrawal from all investments in nuclear weapons. A real victory for the Belgian Coalition Against Nuclear Weapons! Het is alweer 10 jaar geleden dat banken massaal gered werden van hun eigen roekeloosheid. Hoewel we als burger en belastingbetaler het gedereguleerd financieel systeem overeind hielden, hebben we als samenleving nog altijd maar weinig controle over onze banken. De afgelopen NAVO-top in Brussel verliep erg tumultueus. Trump peperde het er bij zijn bondgenoten de hele NAVO-top lang in: hun militaire uitgaven moeten dringend de hoogte in. Op de achtergrond speelt de confrontatiepolitiek met Rusland en vooral de belangen van de wapenindustrie.